Can you identify this Philippines temple? 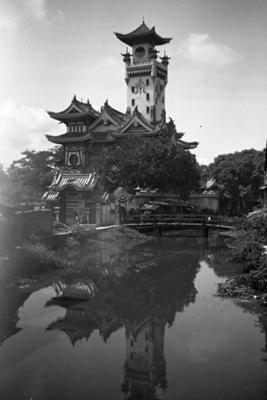 My father spent time in the Philippines during WWII with the US Army and took pictures of this temple. I believe it may have been near Manila. Can anyone recognize where this is? I appreciate any help you can give me! Comments for Can you identify this Philippines temple? Hope this helps. It's quite a striking structure even today. It was sort of whimsical project of the Ocampo family. The Pagoda and the surrounding gardens must have been spectacular. 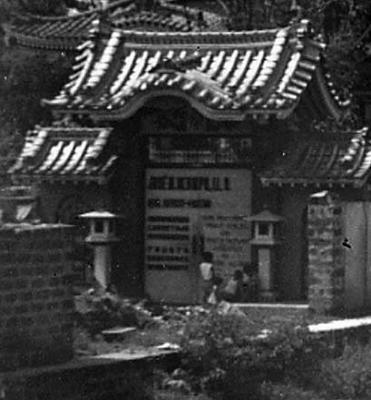 Check out the temple in the Chinese cementery in Manila near caloocan i think this is also the oldest place that has the same temple, or there are Chinese temple in this vicinity, you can ask old people aroung this palce i'm sure they can help. I see the Cebu Taoist temple is listed as built in 1972, so this must be another one. It could be the Cebu Taoist temple in Cebu.